With The Warded Man and The Desert Spear, Peter V. Brett surged to the front rank of contemporary fantasy, standing alongside giants in the field such as George R. R. Martin, Robert Jordan, and Terry Brooks. 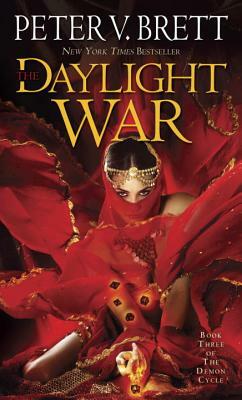 The Daylight War, the eagerly anticipated third volume in Brett's internationally bestselling Demon Cycle, continues the epic tale of humanity's last stand against an army of demons that rise each night to prey on mankind. Arlen Bales was once an ordinary man, but now he has become something more -- the Warded Man, tattooed with eldritch wards so powerful they make him a match for any demon. Arlen denies he is the Deliverer at every turn, but the more he tries to be one with the common folk, the more fervently they believe. Many would follow him, but Arlen's path threatens to lead to a dark place he alone can travel to, and from which there may be no returning. Ahmann Jardir has forged the warlike desert tribes of Krasia into a demon-killing army and proclaimed himself Shar'Dama Ka, the Deliverer. He carries ancient weapons -- a spear and a crown -- that give credence to his claim, and already vast swaths of the green lands bow to his control. But Jardir did not come to power on his own. His rise was engineered by his First Wife, Inevera, a cunning and powerful priestess whose formidable demon bone magic gives her the ability to glimpse the future. Inevera's motives and past are shrouded in mystery, and even Jardir does not entirely trust her. Once Arlen and Jardir were as close as brothers. Now they are the bitterest of rivals. As humanity's enemies rise, the only two men capable of defeating them are divided against each other by the most deadly demons of all -- those lurking in the human heart.